The price of gasoline across the U.S. barely moved from it’s $3.30 national average during the past week, although some people across the East Coast and New England are paying noticeably less for fuel, according to the latest survey from the U.S. Energy Information Administration. The EIA report shows the average price of a gallon of unleaded, including all taxes, remained at about $3.30 this week, while the cost of driving, as measured by the price at the pump, did come down almost 3¢ per gallon for New Enganders and about a penny per gallon for most of the rest of the East Coast. West Coast drivers also enjoyed a slight reprieve, but the volatile Midwest markets had a 2¢ per gallon increase in the price of gas. The price of diesel took an different path during the past week, primarily because refineries are being forced to devote additional resources to meet the winter demand for propane and natural gas. The diversion contributed to a mid-winter price spike in diesel, with the cost of a gallon of shooting up over 3¢ per gallon during the past week, with the national average now at $3.90 per gallon. That figure is fairly deceptive, however, with truckers in many states paying as much as $4.17 per gallon, on average, for diesel. While the Farmer’s Almanac predicted the 2014 Winter would be particularly brutal, the spate of winter storms crossing through the Great Lakes states and the Northeast seems to have caught fuel suppliers off guard, nonetheless. 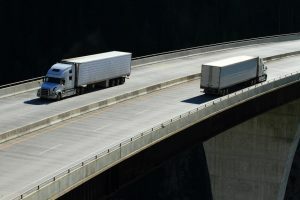 The current price of a fill-up for a tractor-trailer, with two 150-gallon tanks, is now as high as $1251.00 in some areas. Despite the December and early January upward run in costs, the prices of gas and diesel are still lower now that at the start of 2013. The U.S. average for a gallon of unleaded was about $3.36 at this time last year, while a gallon of diesel was about $3.93. 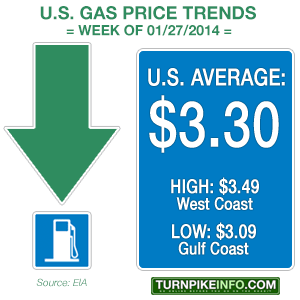 While prices are projected to continue falling through 2014, the start of the year has been more costly for drivers. Prices are, on average, 21¢ per gallon higher than they were just over two months ago. For truckers, the news isn’t quite as bad, with diesel up about 8¢ per gallon over the past two months. Crude oil prices have stabilized from their wild swings over the previous two months, although some instability lingers. The price of the benchmark Brent Light Sweet Crude has come off its December highs, but the index continues to trade in a narrow range between $106 and $109 per barrel. Prices have stabilized primarily because of reduced geopolitical tensions in Libya and the Eastern Mediterranean. The Libyan situation, in particular, has helped cap Brent prices, with supplies flowing at higher levels, although still not at their projected capacity. Meanwhile, the cost of West Texas Intermediate continues to be quite volatile. WTI has been as low as $91.78, on January 13, and as high as $97.35, where it closed only ten days later. WTI is currently trading in the lower $90’s, and prices on early Wednesday were hovering around $94 per barrel.